Posted on April 11, 2011	by Markatos Services Inc.
Markatos Services Inc. uses Vinegar in some of their environmentally friendly cleaning solutions. Learn more about the power of vinegar! Not only is it inexpensive, but not at all poisonous to humans. It’s multi-purpose as well–one container will take care of laundry, kitchen cleaning, even bugs and weeds. Vinegar is a weak form of acetic acid that forms through the fermentation of sugars or starches. It is completely edible, and cannot harm your stomach. And luckily for us, many things can be cleaned using it. The uses of vinegar are nearly endless. In addition to cleaning, it is an excellent item for cooking and for home science experiments (remember the vinegar-and-baking soda volcanoes from grade school?). The health benefits are many as well. For persistent room odors, place a bowl of vinegar in the room overnight. For spills on carpet, use a sponge or cloth to soak up as much liquid as possible. Then spray with a mixture of half vinegar, half water. Let stand for about two minutes, then blot with towel or sponge. Repeat as needed. For more persistent stains, use a mixture of 1-teaspoon vinegar, 1-teaspoon liquid dish soap, and 1-cup warm water. Proceed as suggested above. When finished cleaning, dry using a hairdryer set on low. To clean windows, spray with half vinegar, half water. Wipe clean with either newspapers or cloth. To clean silver, pewter, copper, or brass, dissolve 1-teaspoon salt in one-cup vinegar. Add flour to create a paste (1/4 cup or more). Apply the paste to the metal item, and let stand for at least fifteen minutes. Rinse with warm water and polish with a soft cloth. To clean wood paneling, use a mixture of 1/2-cup olive oil, 1/2-cup vinegar, and 2 cups warm water. Apply to paneling with a soft cloth. Dry with a clean cloth. 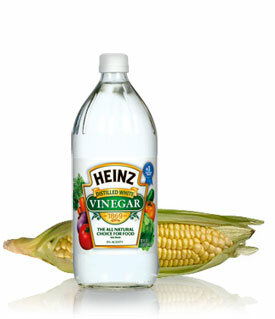 For more information on cleaning recipes and vinegar mixtures visit www.vinegartips.com. Article content is a gathering of information from www.thefunplace.com, www.vinegartips.com and www.thenewhomemaker.com. This entry was posted in Cleaning Tips and tagged Clean, cleaning tips, DIY, Eco-Friendly Cleaning, Home Maintenance, tips, Vinegar. Bookmark the permalink.